Corporations may also contribute to the FOEM through one-time contributions or on-going support. All contributions are 100% tax deductible. Interested corporations should contact Stephanie Welter at 312-445-5712. Corporations are also encouraged to sponsor FOEM events by clicking on the sponsorship tab above. You can now sponsor a student or resident's dues or event registrations! 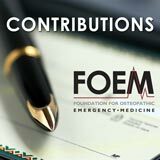 In order to donate to the FOEM RSO Scholarship Fund, send a check to FOEM at 142 E. Ontario, Suite 1500, Chicago, IL 60611 and include "FOEM RSO Scholarship Fund" on the memo line. If sponsoring specific students or residents, you must include a one page document that lists their 1) names, 2) mailing addresses, 3) email addresses, 4) phone number, and 5) whether you are sponsoring their dues or event registrations. All contributions to the FOEM RSO Scholarship Fund are 100% tax deductible and will count towards your lifetime donation total. If you are a student or resident looking to apply for a FOEM RSO Scholarship, please fill out the application below. Any funds left in the FOEM RSO Scholarship Fund that are not attached to specific students and residents will be given on a first come/first served basis.